IIAM, a division of the Musculoskeletal Transplant Foundation, joined with many other organizations dedicated to organ and tissue donation to help prepare the Donate Life America (DLA) float titled “Teammates in Life.” This spectacular Polynesian catamaran replica was propelled by a team of 24 organ, eye and tissue transplant recipients rowing in unison with strength gained from their donors. The sails of the vessel featured 60 floral portraits (floragraphs) of donors interwoven with Polynesian designs and patterns. 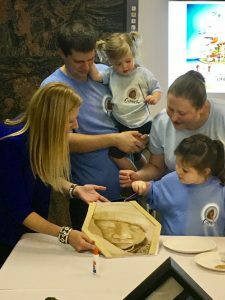 Representatives of IIAM sponsored a floragraph of Ourania Barbara Brennan, who became an organ and cornea donor just five days after her birth in June 2013. Ourania was diagnosed with anencephaly, which is a fatal neural tube defect. 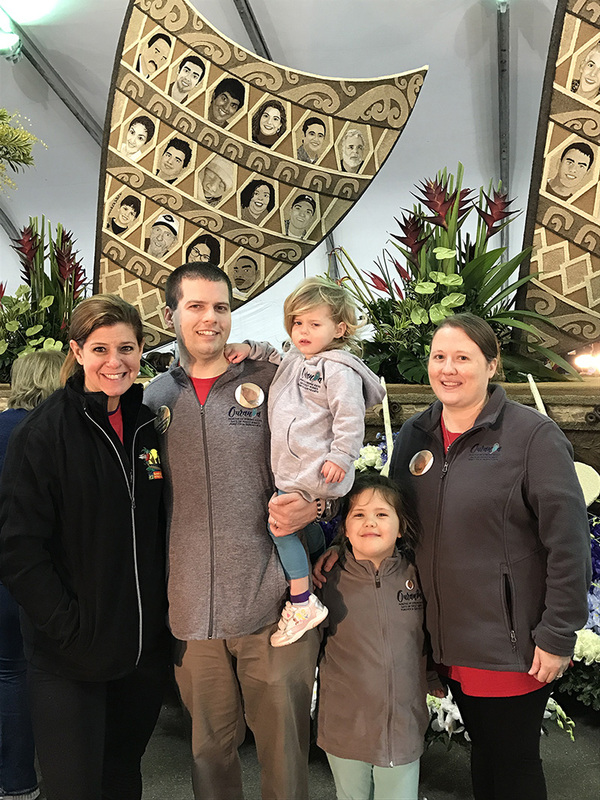 Knowing that she would not survive, Ourania’s parents, Dan and Alison, and older sister Calliope, decided that organ and tissue donation would be the best way to honor her brief life while helping others. Ourania’s gifts allowed researchers to expand their knowledge of Type I Diabetes, pulmonary airway disorders resulting from premature births and a broad spectrum of sight disorders — as well as identify alternatives to whole organ transplant for liver disease. A healthy daughter Thalia was born in 2014. The Brennans share a proud moment with IIAM’s Gina Dunne Smith; Ourania’s floragraph is in the center of the sail. The Brennan family applies finishing touches to Ourania’s floragraph with Lauren Quinn, from Donate Life America. The floragraph is proudly displayed in their home. “Cheering ‘Donate Life’ is an experience we will never forget,” said Alison and Dan Brennan, in a inspiring letter to IIAM. “A new feeling came upon us that day, a sense of community in sharing our daughter with the loving and supportive group present in the stands and the millions of people viewing the parade around the world. IIAM is doing more than providing organs and tissues for medical research. You’re offering hope to families like our own with terminal diagnoses and, for this gift, we are eternally grateful.” To read the Brennans’ entire letter, which will touch your heart, click here. IIAM launched its Neonatal Donor Program in September 2012 as the result of an expectant mother determined to leave a lasting legacy for her child whose diagnosis of anencephaly would render him incompatible with life. Since then, we have assisted 82 families with similar diagnosis and have placed 263 organs and tissues for groundbreaking medical research. Please read the accompanying story in this issue about recent progress in the area of neonatal donation.